It’s said that you can never go home and, when it comes to Los Angeles history, it may well be the case. I get a certain sense of melancholy whenever I’m driving down Sunset Boulevard and I pass the Andaz West Hollywood for I both knew it in a previous life and know of it because it is one of rock music’s most famed and infamous locations. The hotel originally opened in 1963 as the Gene Autry Hotel, owned by the Singing Cowboy of film and recording fame. Autry didn’t retain the hotel for long, selling it in 1966 at which time it was renamed the Continental Hyatt House. 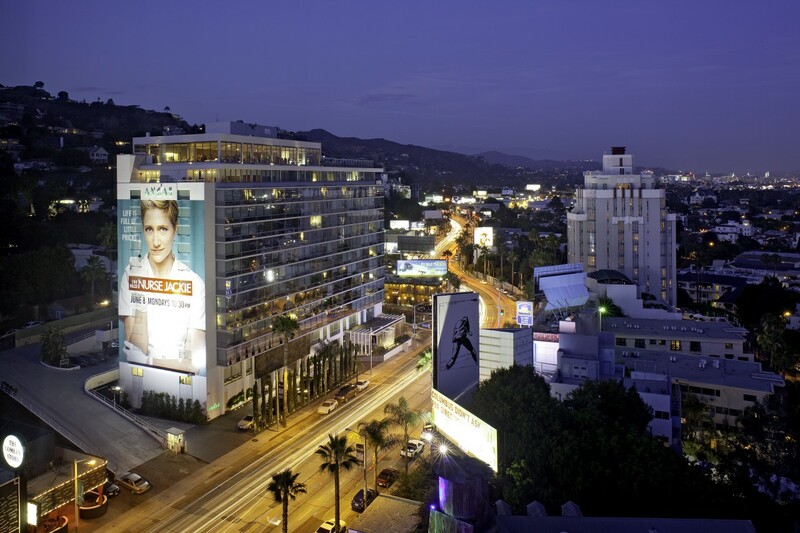 Over the next 30 years, it changed names to the Hyatt On Sunset and, later, the Hyatt West Hollywood. From the 60s, though, it had already started its sordid journey to musical Valhalla by way of the Twilight Zone. It became the hotel of choice for touring rock bands, known as the Riot House to those in the know. Many of the truly extraordinary stories that developed are equal parts hard truth and colourful myth; separating one from the other is almost impossible these days as even those who were there were so mentally splayed by drink, drugs and excessive partying that they have only a nodding acquaintance with the reality. Like so much of popular culture, it’s often a matter of never letting the truth get in the way of a good story. The Lizard King, the original rock’n’roll God known to mortals as Jim Morrison, slithered into the Hyatt in the 60s at the height of his unearthly powers. After months of excess, he was finally evicted after hanging from a top floor balcony by his fingertips. In the 70s, it was the turn of such superstar acts as the Who, the Rolling Stones and Led Zeppelin. Whether it was the Who’s unhinged drummer, Keith Moon, or the Stone’s pharmaceutically-challenged Keith Richards who first became bored enough to start redesigning the décor isn’t recorded but throwing televisions out hotel windows soon became a popular activity for rock musicians. At the height of their fame in the 70s, Led Zeppelin would block-book up to six floors at a time. In scenes that would make Fellini’s Satyricon look like a Wiggles video, the band would drag race motorcycles in the hallways, trash their rooms and generally do things their mothers would never approve of. I stayed there quite a few times in the 90s and clearly remember running into Little Richard, by that time a long-term resident. Despite being in his late 60s, I was always amazed to notice he had the complexion of a 30-year-old. Across the road is the House of Blues, the restaurant and live music venue originally co-owned by actor Dan Ackroyd. It was there I had one of my most memorable brushes with fame. I’d spent the previous few days on hotel inspections throughout West Hollywood and had been invited to dinner at the House of Blues. Afterwards, I was in the top floor private members’ club having a drink when I noticed a man at the bar who seemed familiar. Not being able to place him but thinking he was one of the many hotel executives I’d talked to, I wander over for a chat. After about half an hour of animated conversation, I said goodnight and went back to my hotel. In the middle of night, I woke up and realised I’d been discussing convention room measurements with Micky Dolenz of The Monkees. The Hyatt On Sunset had a makeover a couple of years ago. The Andaz, aside from sounding like a Louisiana sausage, now resembles just about every other boutique hotel ever opened. The balconies have been glassed in, the furnishings are plushly luxurious, there are duvets and widescreen TVs and designer toiletries and you could easily wake up and wonder where in the world you are. Management probably has a policy these days against racing motorcycles in the hallways and you can undoubtedly pitch a tent on the sidewalk and not have a television drop on your head. In all, the neighbourhood has gone to hell. Keith Richards probably wouldn’t recognise the place but, then again, is there anything he does recognise? Reading your blog is like taking a trip without leaving home. How I envy you your travels, and always written with just the right amount of levity! Mickey would understand you’re ‘just trying to be friendly’. Good reading loved the part about the pharmaceutically challenged Keith Richards could not stop laughing. Hey Robert, thanks for the note. I’ll soon be profiling Peter Clifton, the Australian film-maker who, among other things, directed the Led Zeppelin movie, The Song Remains The Same. He worked extensively with the Zepp and remembers the Riot House well. I’ll add some of his recollections to this piece when I get them in order.